The Bay of Quinte region is rich with farming heritage and you will find hundreds of farms scattered throughout the rural areas of our region. Local farmers raise cattle, sheep, chickens, pigs and horses and specialty farms raise emus, alpacas and even water buffalo. Local crops include vegetables like corn, tomatoes, soy beans, potatoes and asparagus and fruits including strawberries, grapes and rhubarb. There are several local apple orchards as well that welcome people to pick their own apples and offer other outdoor activities - especially in the fall. The region is also rich with locally produced cheese and other dairy products, chocolate, wine, beer, maple syrup and honey. The Belleville Farmers’ Market is open Tuesdays, Thursdays and Saturdays year-round in Market Square, behind City Hall in Downtown Belleville. The Belleville Farmers’ Market is celebrating its 200th anniversary in 2016. 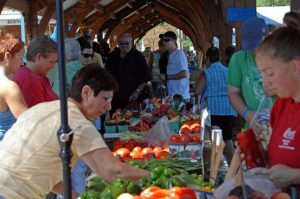 The Quinte West Farmers’ Market is located on Front Street along the Trent River and is open on Wednesdays and Saturdays from May through to October. In The County, there is a Sunday market in Downtown Picton as well as the Wellington Farmers’ Market, which is open on Saturdays in the warmer months, and the Hillier Market is open Friday afternoon and evening in the summer. These markets feature locally grown fruits, vegetables, meats and flowers as well as artisan crafts and other local products like honey and maple syrup.